A diamond’s crown area is incredibly important. Consisting of a diamond’s “top belt”, it resides directly above the gem’s girdle. The girdle, itself, is a diamond’s center-most area—and the identified crown is exactly between this area and the table. While many aspects of a diamond’s perfection are attributed to its overall cut, a stone’s crown, in particular, exemplifies its total shape. Acting as a diamond’s overall ring, it exemplifies inner light well—procuring a gem’s clarity at the stone’s widest point. Historically noted as a gem’s most iconic area, diamond crowns have repeatedly been noted for their lustrous appearance on wedding bands. In many ways, a diamond’s crown is incredible due to its natural formation within a cut, as a stone’s top-crafted table directly impacts the crown’s shape, sharpness and light capture. A diamond’s crown portion should similarly maintain a well-cut angle between 33 and 35 degrees. Such an angle, when set into a base, valiantly reflects light and appears clearer to onlookers at eye level. A diamond’s pavilion is located directly beneath the stone’s girdle. 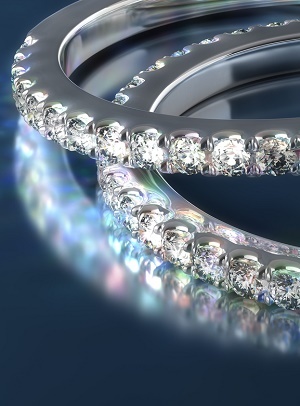 Classically called a diamond’s “center”, it is entirely different from a gem’s physical center, or the girdle. However, a diamond’s pavilion is well-noted for overall thickness, as its design is often attributed to a diamond’s entered and reflected light. Similarly, a crown’s reflected light is passed through the crown, the stone’s widest areas. In essence, a diamond’s pavilion is responsible for the shape light passes through, and “shorter” pavilions may be crafted to reduce acute light spray. “Longer” pavilions, meanwhile, may be implemented to extend traveling light’s projected surface area, sharpening the areas light exits the stone. Historically, a diamond’s pavilion has been directly associated with value, as the pavilion’s shape inherently alters a diamond’s overall mass. Viewers experience a diamond’s reflected light source through the stone’s pavilion, too, and an easily visible pavilion—when shaped well beneath a wider crown—may elicit immediate color and clarity.